When you are not hiring a maid, make sure you do not use any harmful cleaners or mix those two cleaners which are never to be mixed. Both these products are very powerful for cleaning surfaces but if mixed together they emit chlorine gas which can cause coughing, irritation in eyes and breathing problem. When bleach is mixed with an acidic toilet bowl cleaner it releases toxic fumes which can further cause breathing problems and watery eyes. The combination of these two cleaners produces a gas called chloramines which are toxic in nature and can cause irritation and throat burns. These are very handy cleaners readily available in your storage, but these two, when mixed together, gives an ineffective solution since baking soda is basic and vinegar is acidic in nature. Putting them together gives you mostly water and sodium acetate. Using these two products alternatively for cleaning surfaces is alright but never mix them or even store them in a container. Doing so will create a toxic acid called peracetic acid which causes irritation in skin and eyes. Combining these two substances produces chloroform and hydrochloric acid. It is, therefore, a big no combination. Mixing two different drain cleaners is also a big no as it can release chlorine gas which is toxic and causes breathing problems and watery eyes. Certain disinfectants contain sodium hypochlorite which when mixed with detergents create an acidic reaction which releases harmful fumes. Before mixing any two ingredients make sure you read the manufacturer’s instructions carefully. 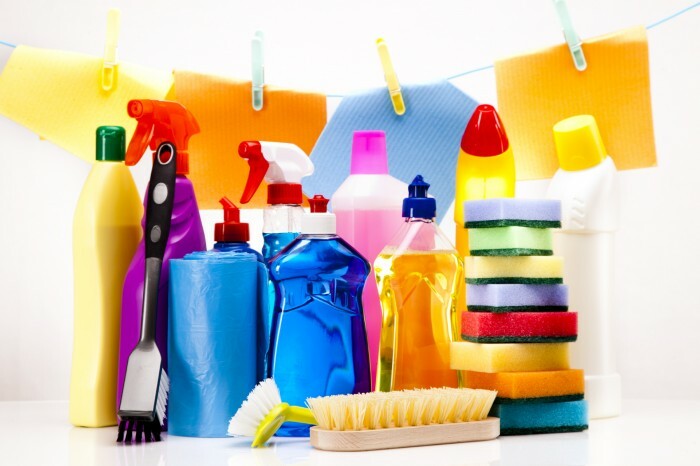 And do not transfer such cleaners into any other container so that you have the product related information handy with you as and when needed. The best way to save you from the hassles of selection of cleaners and tidying up the stuff around you is to visit Maids Around Town and get an expert hired who will clean just everything for you in the most professional manner.